Put your ranch horse to the ultimate test! Christensen Ranch in Crawford, Nebraska, is hosting its inaugural Elite Ranch Horse Challenge July 30-31, with check-in July 29. 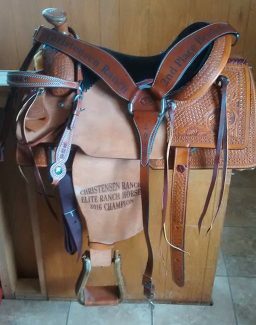 Taylor & Chasidy Christensen’s event features two courses, 18 elite challenges, and awards made by Teskey’s Saddle Shop in Weatherford, Texas, including a saddle, buckles, and a headstall with breast collar. Entry fees are $100 for the first horse, $25 for each subsequent horse per rider; pre-registration is open until July 20 and entry fees may increase beyond that date. The courses are based on AQHA events like roping, reining, trail class, horsemanship, jumping, and cutting, but “not out of the AQHA book, but more like a course to preview a horse. We’re not aiming to get anybody hurt, but show horsemanship levels,” Taylor said. The weekend will kick off with a bridleless pattern course, testing “how comfortable the rider is without bridle and how well they communicate with their horse,” according to the event website. Riders will follow up the pattern with a wooded trail course featuring stations throughout including, but not limited to: trailer loading and unloading, maneuvering a gate, roping a stationary roping steer, side passing a log and a “W” formation, crossing water and bridge, dragging a log, and sorting and holding a heifer. Stations are timed and scored. Christensen Ranch offers accommodations to participants at extra costs, including catered meals and lodging for humans and horses. Questions and concerns may be addressed by calling Taylor at 605-430-0935 or Chasidy at 308-360-2685 or emailing chasidyco@hotmail.com. You may also visit the Facebook event. Their ranch is located five miles east of Crawford at 535 West Ash Creek Road. Two local ranchers and frequent ranch rodeo participants Nolan Brott (pictured) and Clay Ashurst are hosting a Stray Gathering July 29 at the Niobrara County Fairgrounds in Lusk, Wyoming. Contestants must attend a rules meeting at 5 p.m., followed by calcutta at 5:30 p.m., and roping slated to begin at 6 p.m. Viewing the event is free. 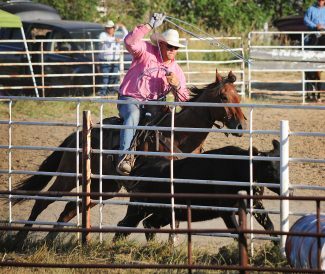 A common ranch rodeo event, stray gathering requires the heading and heeling of one or two steers – one for this event – laying it down, then tying three legs to remain tied for six seconds. Stray gathering replicates just what the name implies. There are instances in which it is not practical to trail a lone bovine or rope and risk choking said bovine for long stretches to get it where it needs to be. Tying it down and later picking it up with a trailer, or tying down a lone calf to locate its mother to reunite is often the quickest and safest plan for the animals. The Friday-night event is limited to 24 teams in a tournament-style roping. Each two-man team will be randomly drawn to compete against a second two-man team. Each pairing will compete at the same time and the fastest time from the pairing will advance to the second round. The 12 teams advancing to the second round will be randomly drawn into pairings of six and the winner from each pairing advances to the third round. The third round will be the same process advancing the winner from each pairing. The short round will consist of the three advancing team from the third round. The final three teams will run together and payout will be based on the short-round time. The event is $150 per team to enter and will pay out 75 percent to three places. The roping is accepting pre-entries by July 26 and each person may enter only once unless spots do not fill. For information or to enter, call event secretary Lexie Ashurst at 307-334-4343. The weekend fun at the Niobrara County Fairgrounds continues with a ranch rodeo Saturday and Niobrara County Fair the following week starting with a gymkhana Sunday.